Surprise, surprise! After a bewildering number of recent projects, Hawkwind founder member Nik Turner has gone back to his space rocking best. He may currently be busy touring the US with his �Space Ritual� show, but �Space Gypsy� suggests he�s still got a lot of exciting new space rock music to contribute to his own enduring musical heritage. �Space Gypsy is a lot better than anyone probably expected, after all not many rockers in the autumn of their career come up with anything fresh and original, but clearly this bristling space rock album is an exception. Look no further than the killer lead single �Fallen Angel STS-51-L�. Written about the doomed space shuttle Challenger STS-51-L by drummer Jason Willer � who adds extravagant drum rolls � it�s given a clever dispassionate robotic vocal by Turner and is easily the best Hawkwind related single for years. 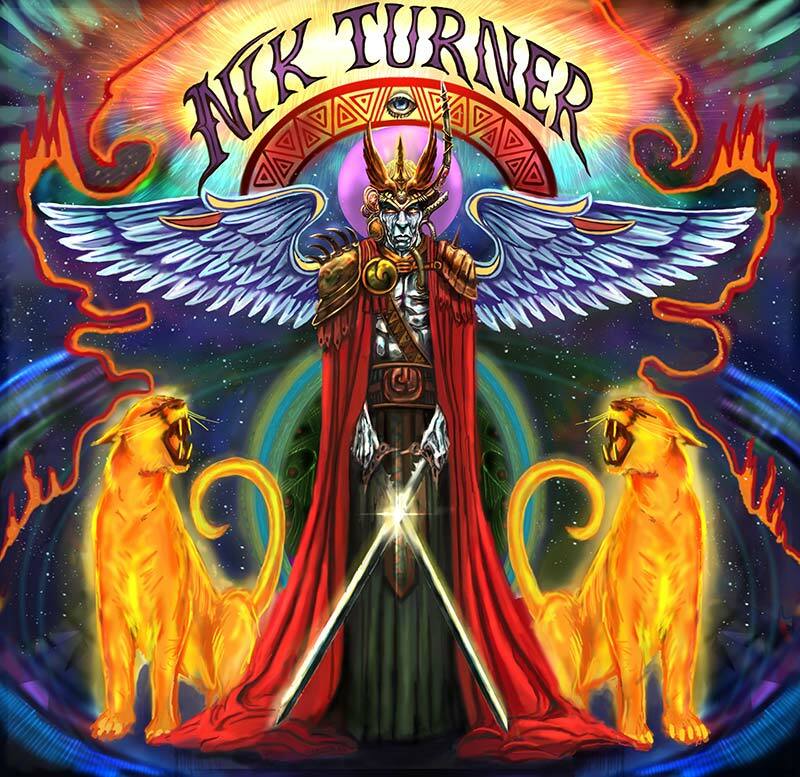 Nick is never too far removed from the essential heart of what used to be Hawkwind, whether it�s with space themed poetry, twinkling synths, moody moogs or jammed out riffs. This is evidenced by the honking sax and space rock wall of sound that makes �Jokers Song� a timeless glance over his shoulder at the band�s early career. Interwoven keyboards, sax and a pounding rhythm track beaver away as Nick�s monotone vocal enunciates some spiky lyrics: �They�re putting a means test on having a child, if you too mean you don�t get one , Gee that�s pretty wild�. Wow, this is such a great start to the album that it begs the question why on earth he didn�t do this before? And the answer is almost certainly that it took this inspired current line-up to make it all work. �Space Gypsy� is a project rooted in Turner�s hippie space-rock antecedents (represented by his guests, the former Hawkwind violinist Simon House and Gong guitarist Steve Hillage) and it is given a fresh injection of energy by his core punk influenced band, which comprises Chelsea�s Jeff Piccinini, UK Subs bass player Nicky Garratt and American (!) UK Subs drummer Jason Willer. More importantly perhaps, the impressive keyboard parts are handled by producer and Die Krupps leader Jurgen Engler who brings his trademark synths and moog sound to give the material a brooding presence. And it is this refreshing spirit of collaboration � with every member involved in some of the song writing process � that makes this such a vibrant album. Jeff penned the heavy �Time Crypt� which owes a lot to Iron Butterfly, while Nicky�s meditative �Galaxy Rise� is the polar opposite, bringing a lightness of touch as Nik adds delightful flute and vocals over an acoustic and synth wash.
Much like the later echo laden vocals and moog of �Eternity� it has an early Hawkwind feel, right down to the tablas and distant seagulls as the vocals hover over a track imbued with a feel good spirit of light and optimism. Engineer Chris Lietz also scores three co-writes including �Coming Of The Maya�, which is an archetypal piece of stoner rocker with echoes of Floyd�s �Set Your Controls To The Heart of the Sun� and Turner�s own �Brainstorm� riff. You may struggle to understand the lyrical meaning but it�s a slice of essential space-rock that takes us into the stars. �The Visitor� is a Turner /Garratt co-write, full of acoustic rhythms, uplifting flute, synth and moog washes and an effective vocal, before an abrupt tempo change and a belated meandering bass line pulls the track back into the opening groove and onwards. �Something�s Not Right� is a worthy bonus track that fuses a manic vocal with enveloping space-rock and is probably destined to become a live favourite. Download available at�iTunes�or order the CD on�Cleorecs.com,�Amazon.